2004 Dufour 34 Performance-17K Price reduction! 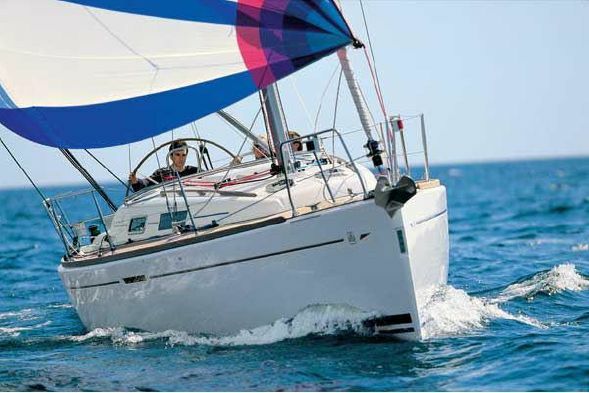 Kamal, The Dufour 34 Performance is a speedy sailing boat for enjoying the Chesapeake Bay in the summer. With 663 sq ft of sail area, you’ll move pretty well in all conditions. While we have sold some of the larger Dufour a smaller boat that you can untie in the afternoon to tear across the Bay and back for a really fun sunset cruise. She’s a really good looking boat that sails incredibly well. Kamal as she is called is lightly used in great shape with only 52 hours on her Volvo diesel. With draft under 5’ you can go anywhere you want and tuck in to any creek and with two sleeping cabins in addition to the salon settees there is room to enjoy a little family cruise. She’s clean and very nice down below with Moabi mahogany joinery that gives her some real warmth and ambiance. Most importantly, she sails so well that you will have a lot of fun. The cockpit is large enough for the whole crew to enjoy. With all the control lines led aft to the cockpit and a single line reefing system with the stack pak with lazy jacks it is pretty easily to sail this boat without leaving the cockpit. The Dufour is just a lot of fun for a family or a racing sailor to enjoy the Bay. Kamal is a great example of this performance sailboat. You will not be disappointed in this boat and she will get your family out sailing! New listing price, $82,500. For more information or to set up a viewing of Kamal, please contact listing broker, Bernie Jatkis. (443) 742-1792.